Check it out and share your thoughts. Take care and have a blessed day. I thought it was cool. I don't want to be overcritical or anything but wanted them to give a little more background information on the study that had begun with. They talked about how people read the bible twice a month. Some people look at that and get disgusted or discouraged. My question is, how often do people read books in general? I know particularly that men don't read much and thus the reason why most authors and publishers cater to/target women. If people are reading the good book twice a month outside of church that might be pretty good, relatively speaking of course. Another thing that bothered me a bit was that they never mentioned where the professor was currently acting as an associate professor. I hate to be like this but I like to know where you come from but that's just me. On another note, I would have liked them to have discussed creation a bit more. I know this is tricky area but I wanted to hear more. Overall I think they did a good job but I after seeing it I didn't want to pick up and read my bible more. Maybe that speaks more about the personality of the people on the show than about their material, I dunno. Nonetheless, that's all I have to say for now. First off, thanks for sharing your thoughts. I agree with you in terms of men not reading as much in general. As an African American male, it seems like that's a common stereotype among African American boys and men, which is that we don't read. They say if you want to keep something from African Americans, then put it in a book. Although I believe that we read more than we're given credit for, the stereotype still exists. 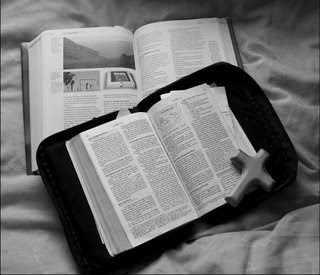 And yes, I do think there is a relationship between reading in general and reading the bible, because one of the things that got me wanting to read more in general was reading the bible more consistently. I also would have liked to hear more about creation, because i'm almost done reading "Darwin on Trial" by Phillip Johnson where the author, a law professor, critically examines the Darwinist argument and the scientific evidence used to support it.